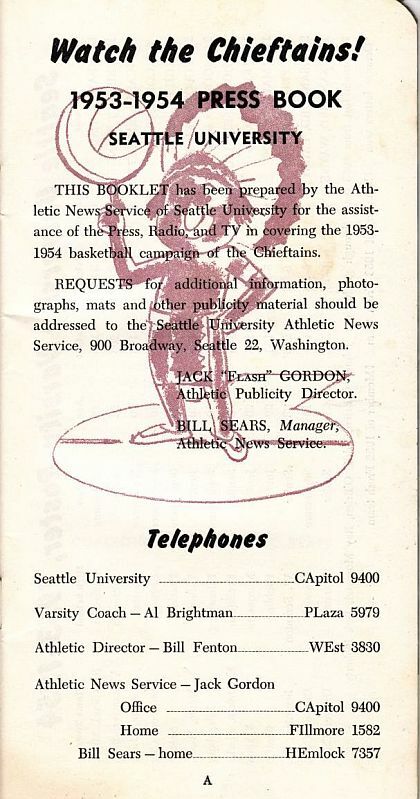 ﻿ JackGordon.org: Meet your Record Setting 1953-54 Seattle University Chieftains! 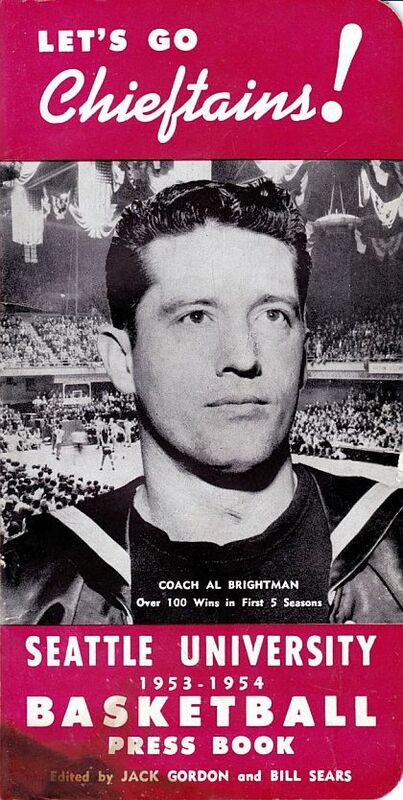 Coach Al Brightman (1923-1992) played for California State University at Long Beach. After graduation, he was drafted by the Boston Celtics (1946–47) of the BAA and played in 58 games. He became the first Celtic to score 20 points in a regular season game. Brightman was hired by Seattle U, where he coached from 1948 to 1956, leading the Chieftains to 4 NCAA Appearances and 1 NIT appearance. He went on to coach the Anaheim Amigos in the ABA in the 1967-68 season. Phone numbers from when the exchanges were just a word. In 2011, 58 years later, Mrs. Jack Gordon still has the "1582" part of the Home phone number. 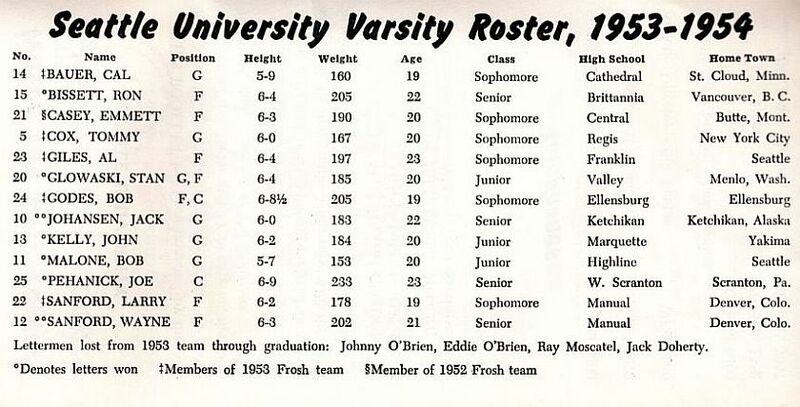 The '53-54 Seattle U Chieftains Varsity squad. Cal Bauer was honored by Seattle University in 2011 for his scoring prowess. And back in 1952, there's Seattle's Franklin High already (or was it still?) a training ground for talented basketball players. Check out this schedule below. 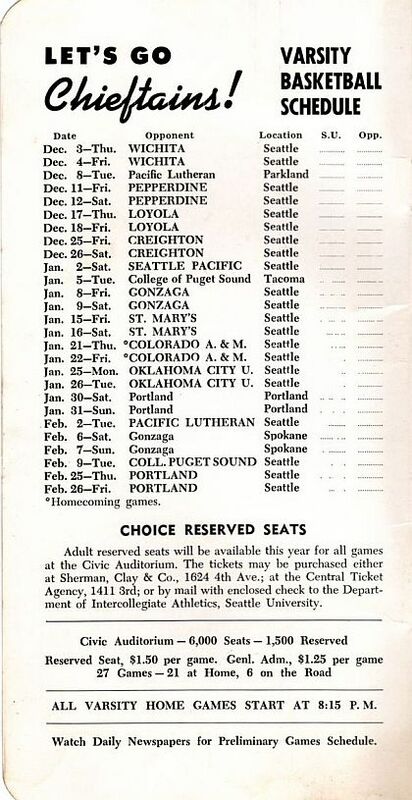 With the exception of the first game against Wichita on December 3, the Chieftains went on to win every game in that year's regular season schedule. Unfortunately, they lost in the first round of the NCAA playoffs to Idaho State.